B.V. 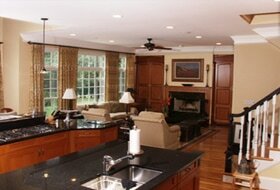 Contracting employs master cabinetry craftsmen who can take your ideas and bring them to life. We've taken a picture from a magazine, and created a custom chef's island, much to the delight and amazement of our customer. Let us design and build a entertainment center to house your audio/visual equipment, or a beautiful mahogany paneled bar in your pub room. Whatever your cabinetry needs, B.V. Contracting can make them a reality. ​Imagine it is a Saturday night, and you and your family are sitting down in your own Custom Theater Room to view the latest release. 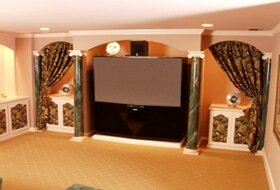 From installation of platform theater seats, to a snack bar, and projection television and surround sound, B.V. Contracting has the experience and expertise to complete the project beyond your expectations.